- In the past 47 years, a million square miles of spring snowcover has disappeared from the Northern Hemisphere. - Since 1970, the winter warming-rate has been triple the rate of the previous 75 years. - The Alps are warming 2-3 times faster than the world-wide average. - Potential Winter Olympic venues shrinks from 19 (now) to 6 by 2100.
and many other facts. Avid skiers like spring skiing. 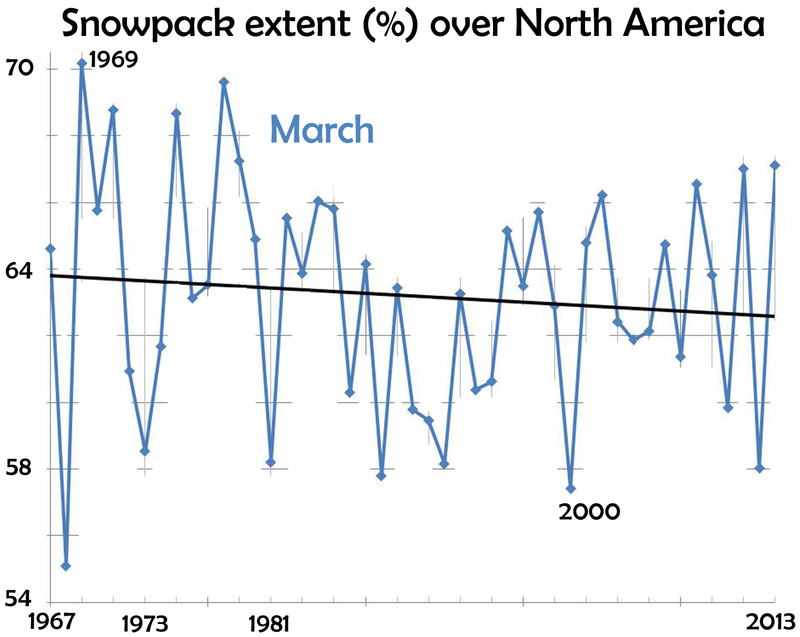 For March, the data (from Rutgers University Global Snow Lab) show a decline in area covered by snow. 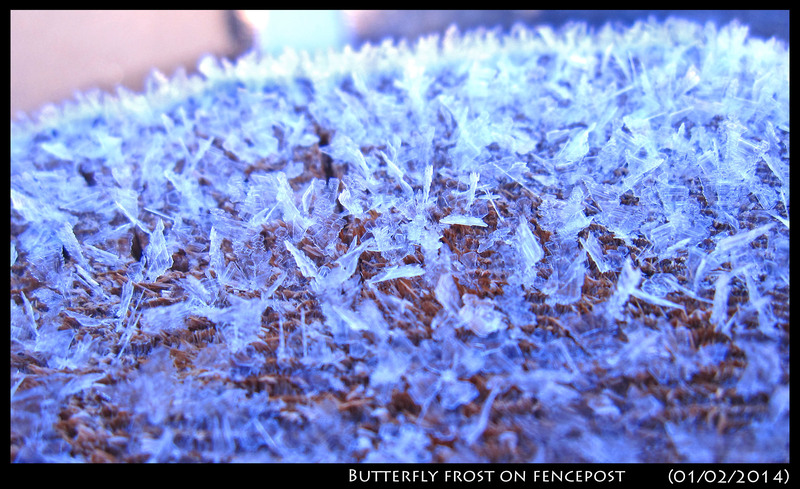 In early January, while visiting a cold, dry region, I saw this frost on a wooden fencepost. 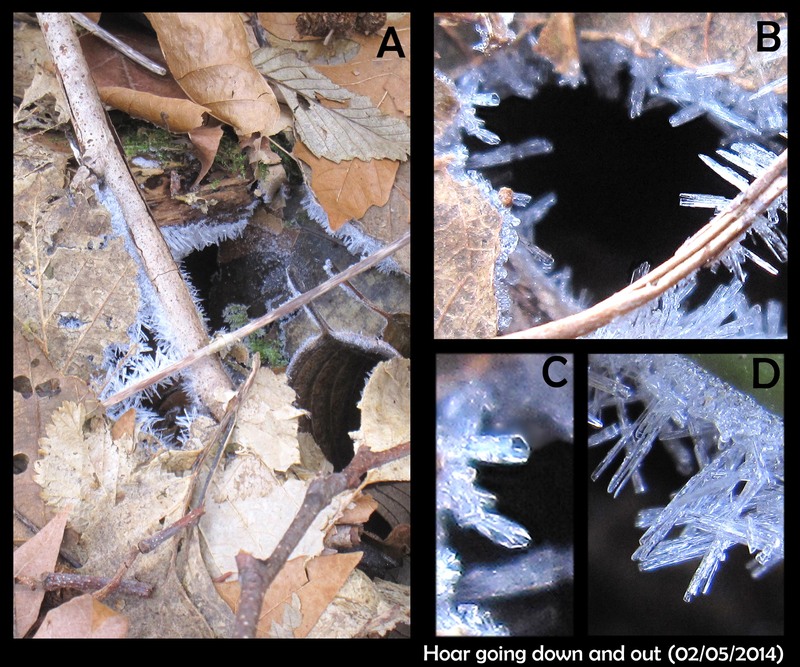 These are a type of hoar-frost, and though hoar-frost grows by the same processes as snow crystals, they can take on an even greater variety of forms. That they have more forms is a consequence of the fact that they can experience much greater levels of humidity, that is humidity relative to their temperature. This greater degree of humidity produces faster growth. 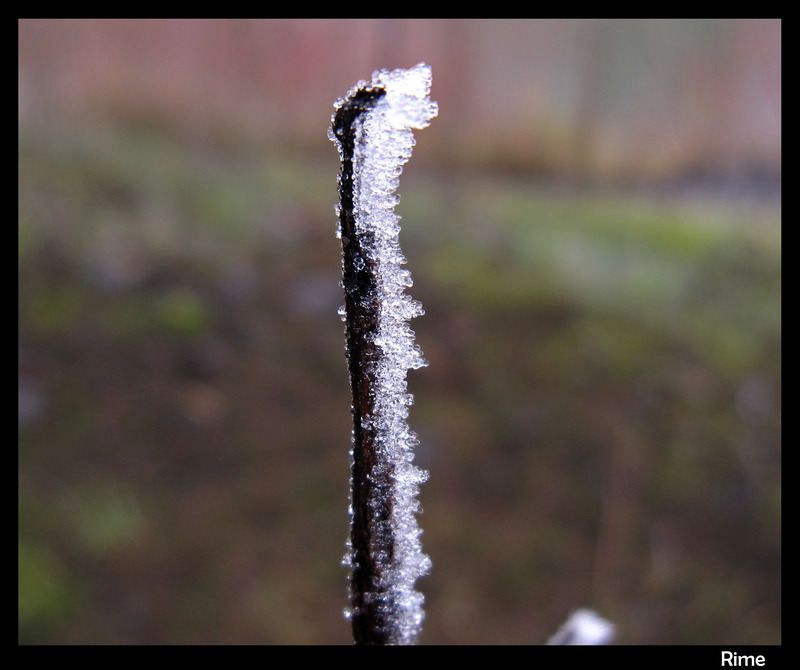 Frost forms can also be more unusual because the proximity of the crystals alter the vapor gradients. When water droplets land on ice, what happens? If the ice is at least several degrees below zero (celcius), the drops freeze quickly, and build up a whitish, bumpy surface. 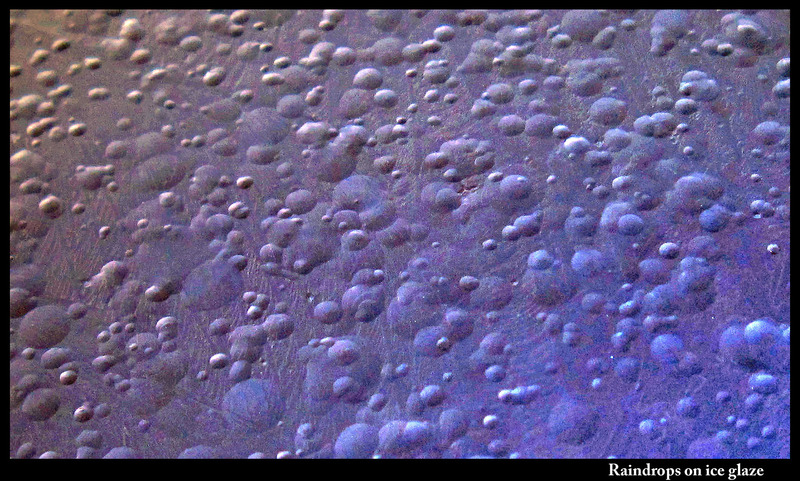 When the ice surface is heated to melting, the droplets vanish into the melt. When the ice is instead very close to zero, the droplet spreads out, but not completely. You can still see the boundary of the droplet. In the early 90s, there was some scientific debate about the ice surface near zero. Some said it had a thin, liquid-water surface, a layer that allowed us to ice-skate and make snowballs. Others said that if that were the case, then a droplet placed on the ice would spread out and vanish. Experiments showed the droplets didn't vanish. The jury is still out on the nature of the ice surface. The famous Japanese poet Basho wrote a poem like the above, except it was about bamboo bending under the snow load. I was reminded of Basho's poem yesterday, as we just had our first snowfall of the season. 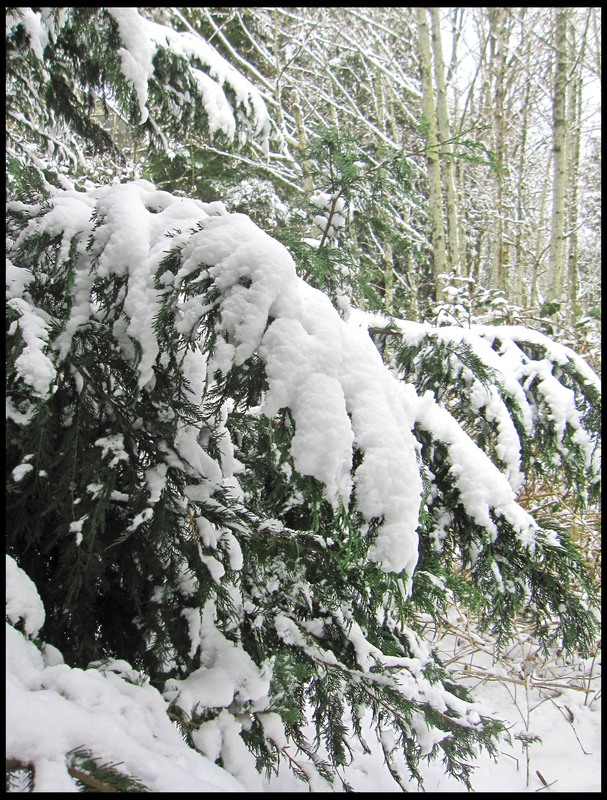 Here in Redmond, about 2 inches, just enough to bend some of the fir branches. And not only the branches were bending. I took the opportunity to check out the pond. It had an ice covering before the snow, but with the snow and warming trend, the ice had thinned, and gotten pressed down under the snow load. The glaze over the pond was bending. 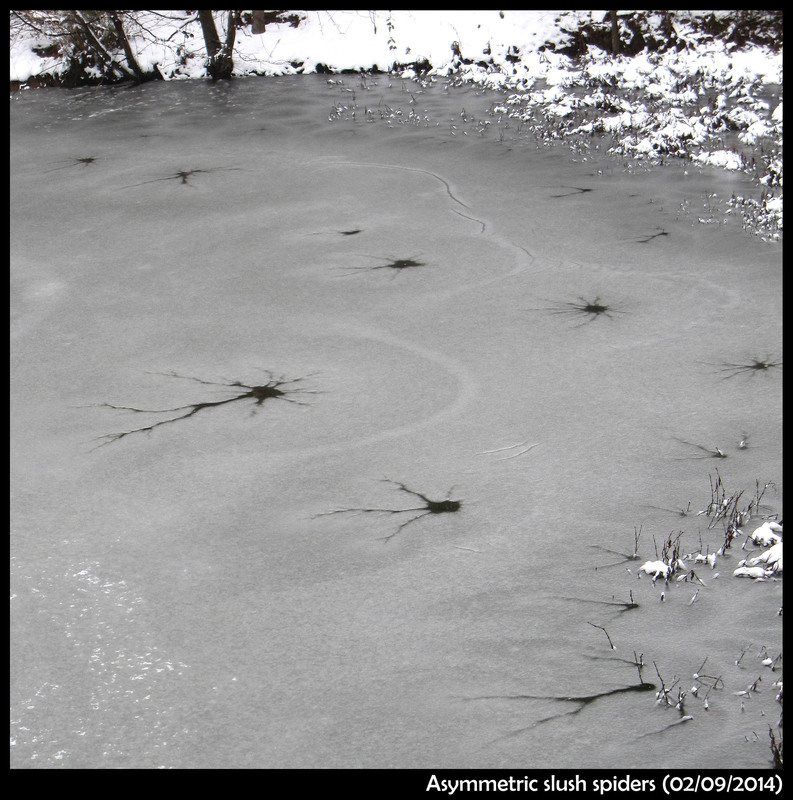 Where a hole appeared in the ice, water got pushed up and out, flowing in dark channels over the icy glaze, forming a spider-like or branch-like pattern in the now slushy snow. I climbed up a tree on the shore and took a few shots. It had been a continued spell of cold days and nights, the ground snow-free, the air clear and dry. No film-frost on the cars in the morning, and no spikes of hoar frost sticking up on grass or post. 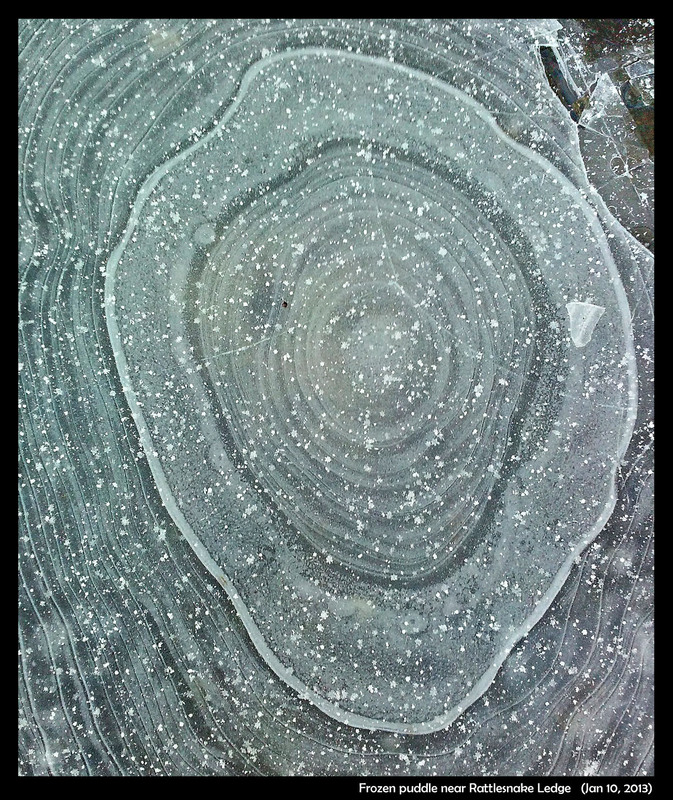 The only signs of ice had been the frozen pond and the needle ice, making the ground crunchy underfoot. 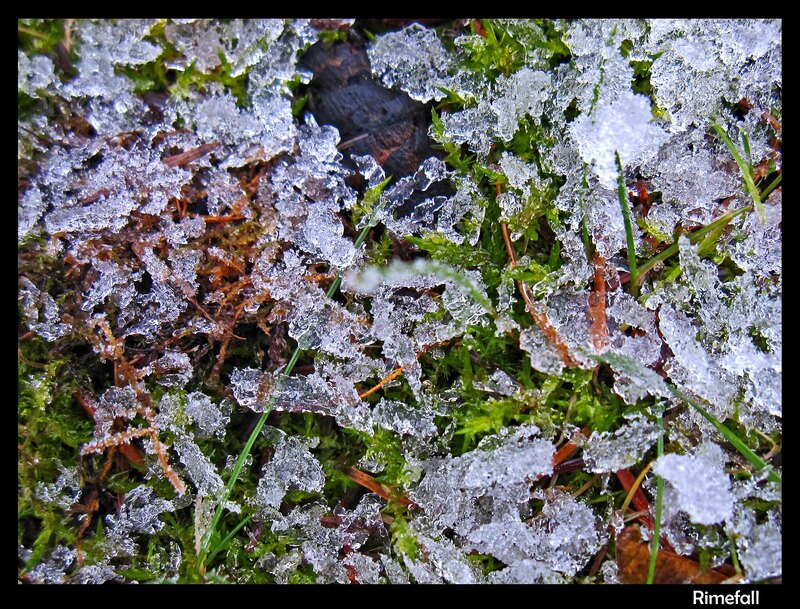 And yet in the woods and lawn, hoar frost still lurked. 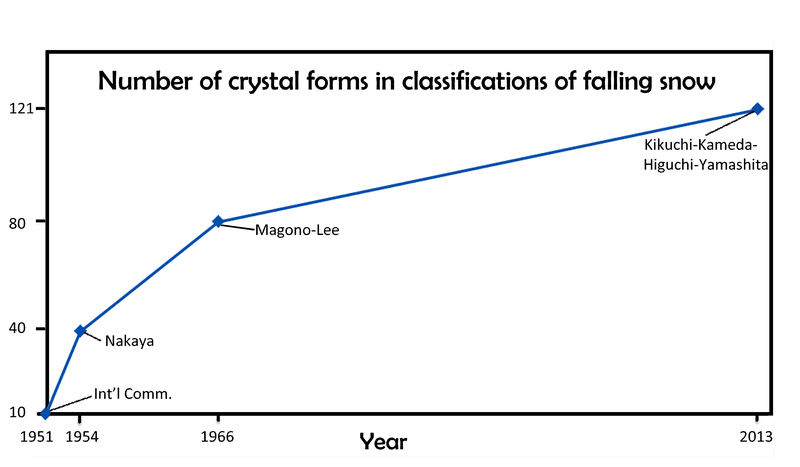 When I last wrote about the classification of falling snow and ice (02/14/2010), I discussed the 1966 Magono-Lee system. At the time, this system was the most recent one, and as such, the one generally used in meteorology. 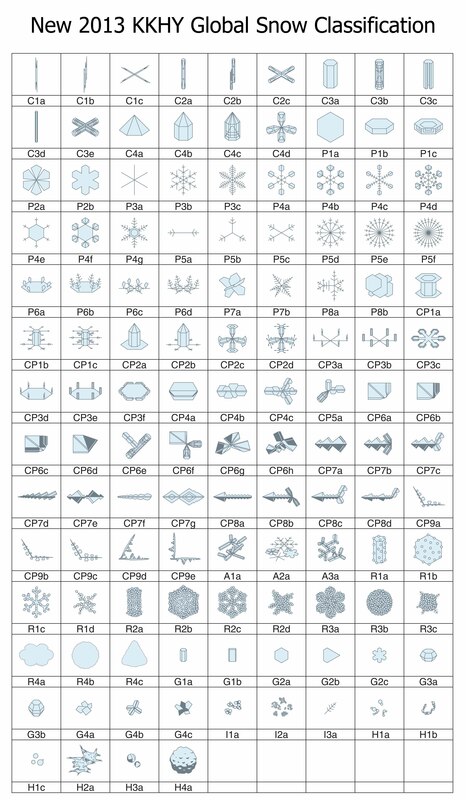 And to those who wondered how many types of icy precipitation exist, Magono and Lee would tell you 80 types. Although 80 sounds like a lot, Magono and Lee did not include at least one very common type as well as a few other interesting types. This major omission was snow-crystal aggregates, generally known as “snowflakes” by meteorologists. These are individual snow crystals that have stuck together during their fall and arrive as large open clusters of crystals, often with tens–to–hundreds of crystals in a big, round blob. (To meteorologists, a snow crystal is not a snowflake; rather, a snowflake consists of many snow crystals. It is like the difference between a trundled rock and a landslide.) In fact, the snowflake is probably the most common type of snow precipitation in most areas that receive snow. Several other omissions of the Magono-Lee that I mentioned in my 2010 posting included spearheads, seagulls, and the both the 18- and 24-branched forms. The architects of this new classification scheme published the above table in summer 2013*. There were four authors (K. Kikuchi, T. Kameda, K. Higuchi, and A. Yamashita), making it harder to name the system after the originators, but hopefully their names will become known, just as Magono and Lee’s have. I will discuss various aspects of this new system in subsequent postings. But for now, I point out that the number of basic types has increased over the years, from 10, to 40, to 80, and now 121. When will it ever end? Of course, it may just keep increasing. In fact, if we plot the numbers vs the years, and look at the pattern, we might conclude “never”. What makes the thick curvy lines in frozen puddles? Notice how it has drained – the light color is due to the air underneath. The lines are roughly concentric with the shape of the puddle, though there can be considerable variation. On larger puddles or ponds, you might just see these thick curvy lines just near the shoreline. 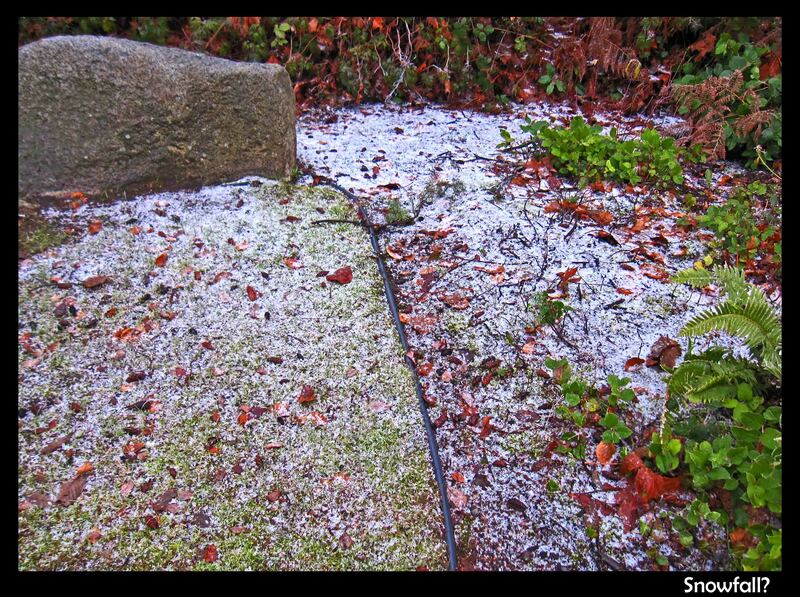 While riding my bike home the other day, I saw what appeared to be a patch of light snow. Just above were the branches of a huge Douglas Fir tree. Perhaps there had been an over-active squirrel or two up there. Other trees still had their rime. Hard to see why only this tree would have its rime fallen off. The Pacific Northwest has been foggy a lot lately, but the fog droplets have been subzero, or supercooled. When such fog droplets hit an object, they almost always freeze. 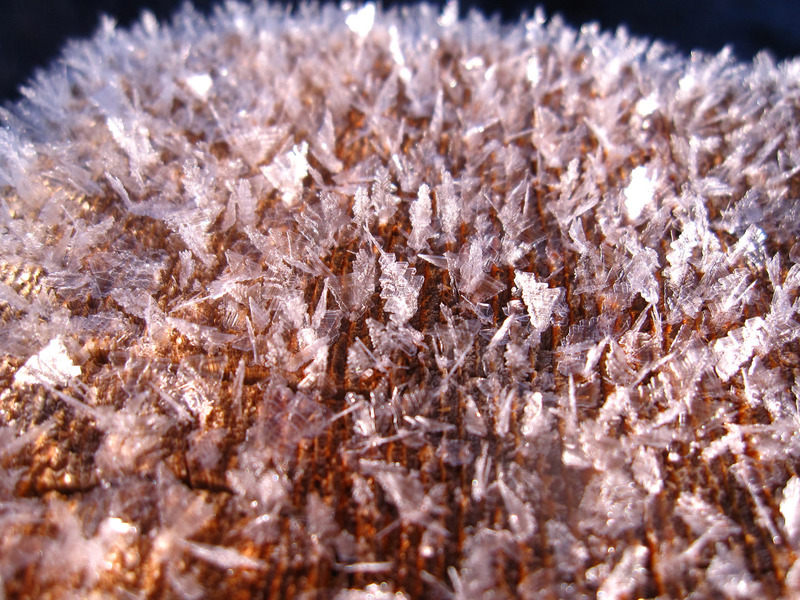 The resulting frozen aggregate is called rime. Freezing fogs make rime. The resulting rime formations may look like hoar frost, or even snow, from a distance. But close up the special features of rime become apparent. 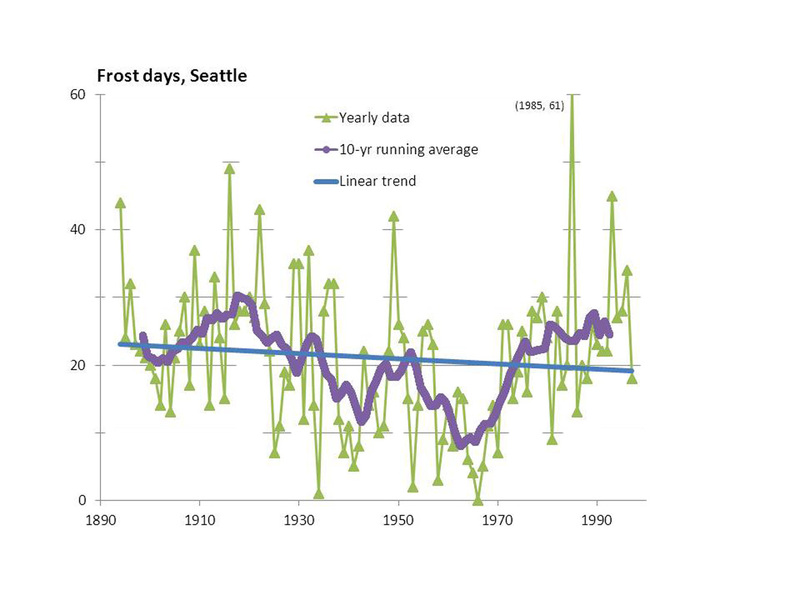 David Easterling recently reported in BAMS** that the number of frost days per year is decreasing over the US. A frost day is a day in which the minimum temperature goes below the melting temperature of ice (32 F or 0 C). This doesn't sound good for a frost observer like me. Moreover, the largest decrease, a value of 2.6 fewer days per year per decade, is in my area, the Pacific Northwest. Will frost soon be a threatened species? His analysis and presentation was based on 1948-1999 data, and moreover, he averaged over multi-state regions. I'm more interested in my local area, King County, Washington, and would like to see both the longer-term trend and variability. I quickly sent him an email, requesting more info. But I was impatient and sought the raw data myself. Following the info in his article, I found the data online***. An added plus: at many stations, the data now goes back another 50 years. With a few simple commands typed into an Excel spreadsheet, I determined the longer-term trend for a station near the University of Washington stadium in Seattle (the only such site in Seattle).